At the beginning of tonight’s episode, Michael is acting like the petulant child we know he can be. His argument to Holly is that it is simply logical that they should be together: Forget giving her time to get over A.J., and forget the fact that she technically only called it a break. They are simply so made for each other that they should have been dating the day after it all went down. It’s a particularly childish moment for the character, fitting for an episode that very purposefully positions him as a stranded toddler who doesn’t know how to find his way home. It takes a number of leaps in logic (Jim can’t communicate through a gas station door! Michael took his cell phone and wallet out of his pockets and put them in Jim’s car! Michael is entirely reliant on Speed Dial! No one comes into the gas station who could let Michael borrow their phone for long enough to call 411!) to get Michael to the point of his Walkabout, and so a lot was riding on the end result. Many comedy storylines tend to operate this way. 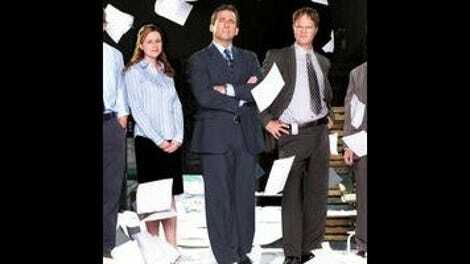 The idea of the entire office having a caption contest, for example, very much depends on the quality of the captions. If they’re clever or reveal something particularly interesting, the storyline could become an oft-quoted classic. If, however, they’re just a long string of jokes at Gabe’s expense that somehow revolve around a picture of two dogs on an island, the storyline seems like a waste of time. Yes, there was some level of satisfaction in Gabe getting his comeuppance, considering the fact that the character became a prototypical douchebag a few episodes ago, but if that becomes “the joke” then the storyline isn’t living up to its potential. Those office minutiae storylines are a nice sort of “slice of life” distraction at times, but this one became too one-dimensional too quickly (although the identity of the person behind the most tasteless joke was a nice twist). By comparison, the eponymous search for Michael had a bit more going for it. The caption contest very much divided itself into two pacts: Gabe on one side, and everyone else on the other. To me, this is silly: there was plenty of opportunity for in-fighting amongst the employees, as what started as an attempt to rail on “the man” could devolve into an all-out competition between different factions. 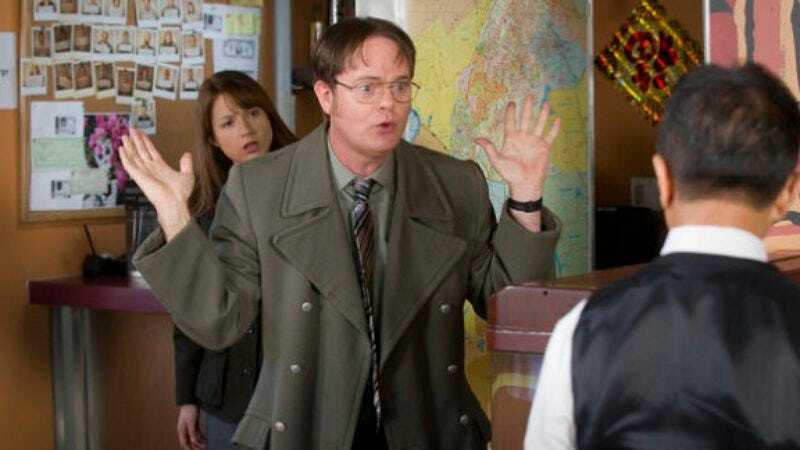 What worked better about Dwight, Erin, and Holly heading out into the mean streets of “Scranton” to find Michael was that there were some engaging undercurrents. Most specifically, despite initial umbrage taken as a result of my love for Holly and Amy Ryan in general, I love(d) Erin’s hatred of Holly. That it has continued for multiple episodes has only made it more effective, as evidenced by the fact that tonight’s talking head made me crack up even though it basically just reestablished her previously stated opinion on the matter. Putting them together, along with Dwight for a bit of added zaniness, allowed the search to mean something. I didn’t find Steve Carell wandering around various businesses in search of purpose and sustenance all that engaging, outside of the simple yet effective strategy of “Michael Scott talks to adorable puppies like they're people,” but I liked seeing how the three of them approached finding Michael differently. Dwight tries to put himself into Michael’s head, but only succeeds in transposing his own logic onto Michael. Erin uses her intense knowledge of Michael’s day-to-day life in order to predict his needs and whims, but gets most of her ideas shot down by Dwight. Holly, meanwhile, turns out to be the Michael Whisperer, so much like Michael that her instincts turn out to be almost identical to his own. It’s all a bit silly, but there was a subtlety to the storyline that I very much appreciated. Dwight was being a bit intense, but he still agreed to pick up paper towels and chocolate syrup for Pam while he was out. Michael was desperate and a wee bit childish, but he never got to the point of throwing a tantrum (even when labeled a thief at Mr. Choo’s). In some ways, the romanticism of the ending (as Holly and Michael both end up on top of the same building on instinct and instantly realize that they’re perfect for one another) almost seems too cute for a storyline that otherwise walked a fine (and interesting) line between a zany comic setpiece and how regular people—particular regular people, what with Erin’s growing admiration for Holly as the hunt goes on—would normally act. And yet while I wouldn’t necessarily agree with Michael that it is just common sense that the two should be together, I am rooting for them. That moment was the show at its most blindly romantic, and it was more than a bit hokey for Holly to be right about everything as if she was actually psychic, but I remain in the pocket for these two. The decision to use Erin’s newfound respect for Holly as a sort of permission was also quite charming, as if something in the universe made it so that they couldn’t get back together until Michael’s new secretary approved of his choice in companion. It was resonant in a way that the show does not often achieve, and even if the episode wasn’t quite laugh-out-loud funny, it did feel as though it strategically employed its comedy for a specific purpose in at least one of its storylines, and I thought the result in that instance was enough to keep the episode afloat. There’s an argument to be made that Gabe’s attempt to shut down the caption contest was some sort of commentary on network executives, what with his rules against pop culture references and badmouthing your boss. It sounded a lot like another comedy that airs on NBC on Thursdays, actually, although the storyline didn’t go anywhere to drive home that satire any further. Per a discussion in an earlier comment section, Michael directly addresses the camera as he begins his Walkabout (which, by the way, I’m taking as an overt Lost reference regardless of the fact that they existed long before Lost). Speaking of the Walkabout, interesting that Michael made no reference of his previous Walkabout in “Survivorman.” And by “interesting” I mean “not surprising,” as I imagine even the show itself wants to forget about that terrible Green Week tie-in. A bit of a strange cold open, given our complete lack of context, although maybe strange enough to work in that the absolute confusion of the office seems purposefully reflected back to the audience. Either way, it was a fun gag and an enjoyable bit for Novak/Kaling, so what’s there to complain about? I am madly in love with the idea of Darryl writing his own captions for Family Circus cartoons, and it probably got the biggest laugh in the entire episode for me. If you also laughed, or wonder why others might be laughing, do check out the Comic Curmudgeon’s breakdowns of the bizarre and terrifying world of Billy, Jeffy, Dolly and that little brat P.J. (Just kidding, P.J.—you’re the only decent one of the bunch). I sort of think it would have been funnier if Creed’s photo on the wall at Mr. Choo’s had been more of an Easter Egg for us to find than something for the cameraman to zoom in on, but I enjoyed it (and Creed’s “Heh, Gloves”) nonetheless. "It was easy once I decided I wanted the dog to piss on Gabe." The Office: "Michael&apos;s Last Dundies"